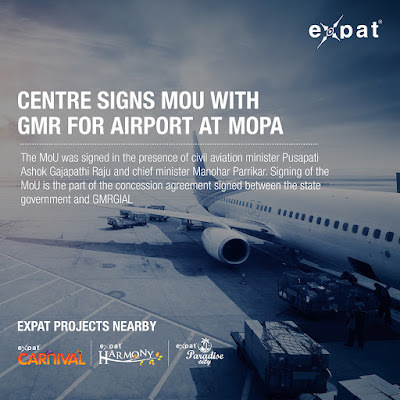 PANAJI: Ministry of civil aviation and GMR Goa International Airport Limited (GMRGIAL) signed the memorandum of understanding (MoU) in Delhi, on Friday, for necessary support from the Centre for developing the international greenfield airport at Mopa. The MoU was signed in the presence of civil aviation minister Pusapati Ashok Gajapathi Raju and chief minister Manohar Parrikar. Speaking to TOI, director for civil aviation S Shanbogue said that with the signing of the MoU, GMRGIAL will get all the required support from the Centre for the development of the Mopa airport. Signing of the MoU is the part of the concession agreement signed between the state government and GMRGIAL, he added. As per the concession agreement, the company will have the right to operate the business for 40 years, extendible by another 20 years. Soil testing has been completed and land will be handed over to the company next month after which they will commence the work, Shanbogue said. On September 20, 2016, GMR Airports Limited had given its acceptance to the letter of award issued by the state government to it on September 17, 2016, for construction of the greenfield airport.